Intimate Politics explores these practices that have constituted eastern Hui’an residents, women in particular, as an anomaly among rural Han. This book asks what such practices have come to mean in a post-1949 socialist order that has incorporated forms of marriage, labor, and dress into a developmental scale extending from the primitive to the civilized. Government reform campaigns were part of a wholesale effort to remake Chinese society by replacing its “feudal” elements with liberated socialist ideals and practices. As state actors became involved in the intimate aspects of Huidong women’s lives, their official models of progress were challenged by the diversity of local practices and commitment of local residents. These politicized entanglements have generated what the author calls “intimate politics,” a form of embodied struggle in which socialist civilizing agendas—from the state-sponsored reforms of the Maoist decades to the market-based “reform and opening” of the post-Mao era—have been formulated, contested, and, in some cases, transformed through the bodies and practices of local women. Friedman, Sara. 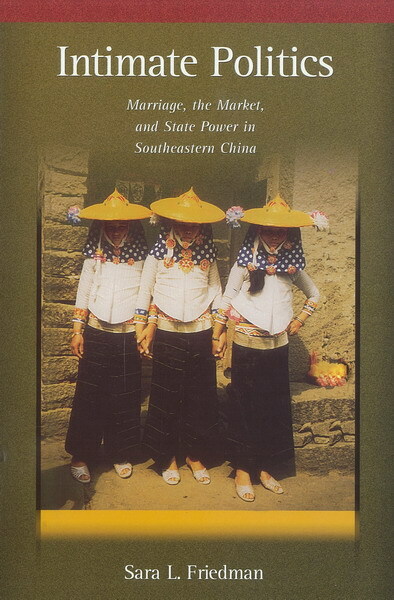 Intimate politics: marriage, the market, and state power in southeastern China. Cambridge, Mass: Harvard University Asia Center Distributed by Harvard University Press, 2006. Print.